This day starts with a visit to the ruins of St Augustine’s Abbey and the Church of St Martin. We then pass through woodland and meadows to Fordwich where the Church of St Mary the Virgin holds what could be the remains of St Augustine’s tomb. Next are Littlebourne and Wickhambreaux, for spectacular stained glass in a most charming setting followed by Stodmarsh and the Red Lion Inn. Queen Bertha was given permission by King Ethelbert to worship at an old roman chapel outside the walls of Canterbury which she renamed after the patron saint of her home town, St Martin of Tours. When Ethelbert was baptised by Augustine, the King gave him the land between the city walls and St Martin’s to build a monastery and it is here that both the Kings of Kent and the early Archbishop’s of Canterbury, including St Augustine, were buried. It is hard to exaggerate the importance of this Abbey nor the shock of it’s demolition by Henry VIII. Perhaps the nearest equivalent church would have been Westminster Abbey, resting place of monarchs and of central cultural importance to the Nation. The monastery was named St Peter and Paul until the reforms of St Dunstan, since when it has been known as St Augustine’s. Click on the maps for larger versions and click again to zoom in. From the Cathedral Gate head down Burgate to the ring road and then left along the city wall to a pedestrian crossing on your right. Cross here and head straight on past the statues of Bertha and Ethelbert to the imposing entrance to the King’s School (originally part of the Abbey). Here turn right and then first left up to the Abbey entrance on the left. The stone marking the original resting place of Augustine is in the nave of the ruins. From the Abbey continue up Longport, past the University buildings and the old prison to North Holmes Road on the left. This leads up to St Martin’s Church (open from 11am most days). Now continue on past the church up St Martin’s Avenue, by the Conduit House (source of the water for the Abbey) and through the alleyway to Chaucer Road. Cross over and head to the far side of the green opposite where there is a stile into woodland. Now continue through the wood and over the meadows for a mile and a half to Fordwich, keeping straight ahead and to the left where the path branches. The George and Dragon is opposite and the Fordwich Arms round to the right by the Church. Either pub would be a good place to stop for lunch. Straight opposite the entrance to the Fordwich Arms car park is the path which turns left round the back of some houses. At the second kissing gate turn sharp right up the hill alongside some paddocks. Shortly after the crossroads, the path shoots diagonally up to the left through a hedge. Follow this and turn immediately left on a good path through the plantation. Eventually you come to a T junction where turn right and then at the crossroads turn right again taking the track up through the woods to the road. Go straight across and take the forest track ahead. Pass through the crossroads and at a T junction turn sharp right and then sharp left shortly afterwards. This crosses the Lampen stream and skirts a meadow before leading up to the left through the woodland to another lane. Turn right and immediately left, following the track alongside the solar panels. This track passes Brick Kiln Cottage before turning sharp left to the road at Littlebourne. The Church of St Vincent is 100 yards down the lane to the right. Don’t be put off if the lychgate is closed, the church is normally open during daylight hours. Inside you will find an extraordinary set of gothic revival stained glass windows by Nathaniel Westlake. On leaving the church note the large thatched barn to your right. The footpath passes round the side of the church to the left and to the corner of the churchyard, then across some paddocks to the lane. After accompanying the road for a short stretch the path turns to the left opposite the large white weatherboard mill and follows the stream across the meadows to the church of St Andrew at Wickhambreaux. Inside you will find Art Deco stained glass by Arild Rosenkrantz including the renowned East Window dedicated to the Annunciation. Leave the churchyard by the main gate onto the village green with the picturesque Rose Inn opposite. 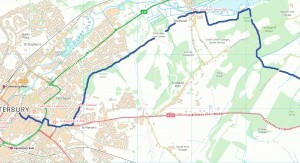 It is worth visiting as the last stretch of today’s walk is an easy amble through orchards to the Red Lion at Stodmarsh. With your back to the Rose Inn take Grove Road to your right and follow it round to the right and out of the village. Opposite a large thatched cottage the footpath crosses diagonally across a field to the corner of a farmyard. Head straight across and follow the track in the same direction between the poly-tunnels of soft fruit. Where the track turns left follow the path to the right and then sharp left before coming to a gap in the hedge on the right. From here cross the fields diagonally using the road sign in the distance as a marker. Once at the sign continue in the same direction across the next field to the lane just outside Stodmarsh. The Church of St Mary is on your right as you enter the village and is always open. The Red Lion is just opposite. Canterbury is a major transport hub with regular fast trains to London and the rest of Kent. 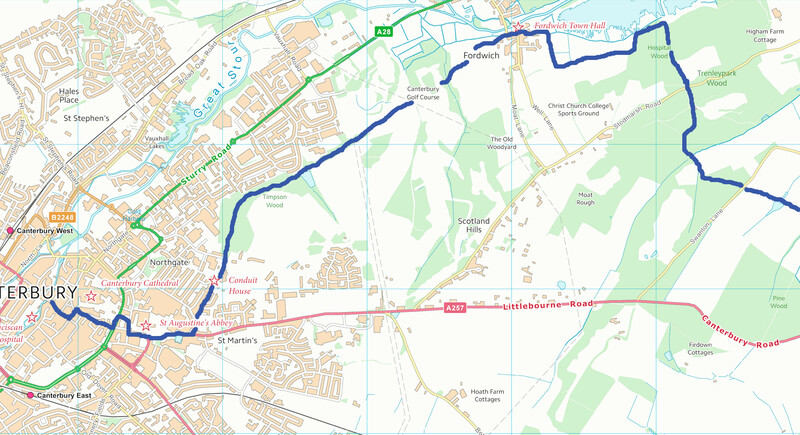 Bus numbers 8, 8A and 8X run regularly between Canterbury (Whitefriars) and Upstreet which is five minutes walk down the hill to Grove Ferry. 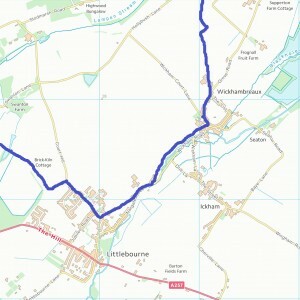 The number 11 bus runs between Canterbury, Littlebourne, Wickhambreaux, Stourmouth, Minster and Westwood Cross (near Ramsgate). There is accommodation available at Stodmarsh, Grove Ferry and Stourmouth. 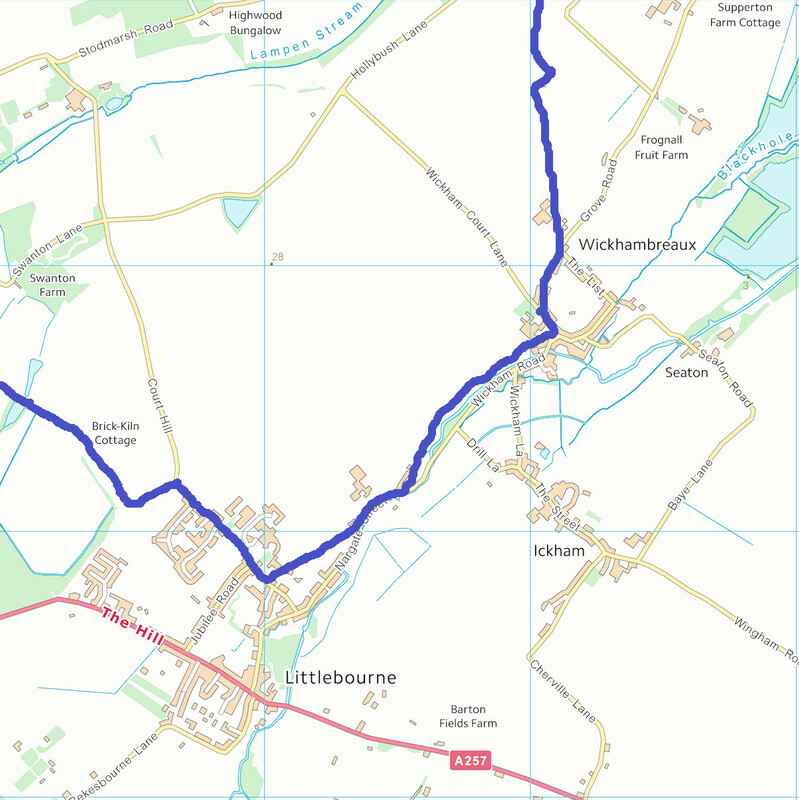 There is a full range of shops in Canterbury, a grocer’s in Sturry (next to Fordwich) and pubs at Fordwich, Littlebourne, Wickhambreaux, Stodmarsh, Grove Ferry and Stourmouth (The Rising Sun, half a mile up the path through the churchyard of All Saint’s Church).